The Conservatives are entering tomorrow’s general election without answering four key questions about their disability policies on social care, forced institutionalisation and welfare reform. 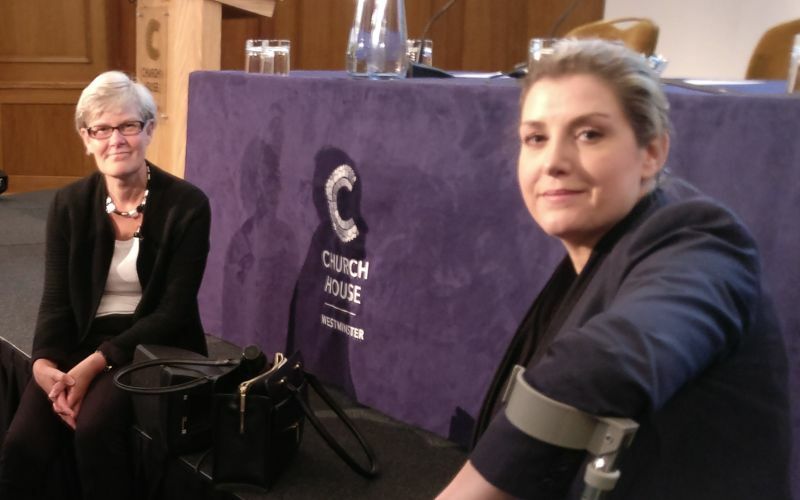 Last week, the minister for disabled people, Penny Mordaunt (pictured), refused an interview with Disability News Service (DNS) and then failed to respond to questions submitted by email. The party’s press office has this week again failed to answer important questions from DNS in four key areas. One question the party – and Mordaunt herself – has refused to answer is whether there will be any further cuts to disability benefits in the next parliament. The manifesto promises only that the party has “no plans for further radical welfare reform” in the next parliament, but stops short of ruling out any further cuts to disability benefits, and warns that a Conservative government would continue to ensure a “sustainable” welfare system, with help “targeted at those who need it most”. On social care, there is still no clarity from the party on its policy on charging for adult social care for working-age disabled people. The prime minister, Theresa May, was forced to announce a cap on lifetime care charges – although no suggestion of what level this would be set at – in addition to the manifesto’s pledge that every care-user would be able to retain at least £100,000 of their assets and savings. But the manifesto was focused solely on care for older people, and following her U-turn the party has refused to say what it has in mind for working-age disabled people, who make up about a third of social care service-users. Younger disabled people pay more in care charges than older people and will have had less time – and in some cases no time at all – to build up any savings. Mordaunt has also dodged questions about her views on the forced institutionalisation of disabled people. Concerns about her views arose after she was asked by the campaigning website Disability United if she opposed forcing disabled people into institutions, and what protections she would put in place for those facing such a threat. In her answer, she said that a decision about whether to institutionalise somebody against their will was “rightly a matter for medical professionals, and decisions should be made on the grounds of individual safety and health”. That answer raised serious questions about her commitment to the rights of disabled people to live in their own homes, even if she misunderstood – or chose to ignore – the issue Disability United was trying to raise, about the threat of disabled people being institutionalised purely on the grounds of cost. The party has also refused to say whether Mordaunt misled last week’s disability hustings event when she claimed that another Tory government would “dismantle” the work capability assessment. But that commitment is not mentioned anywhere in the Conservative manifesto, and is also not in the government’s work, health and disability green paper, which talked instead about improving the WCA, and suggested the WCA could be used just to decide eligibility for financial support. The party had failed to respond to the latest requests for clarification on these four questions by 11am today (Wednesday).